Usually, noncreature permanents that turn into creatures are valuable because they're only creatures on YOUR turn, therefore your opponents' sorceries can't target or destroy it. Warden of the Wall turns that on its head-- it's only a creature on everyone else's turn. Which means you can never attack with it, only block. And your opponents' sorceries will be able to deal with it no problem, but your own won't. Warden of the Wall is therefore safe from your own Day of Judgment, but still can't attack your now-creatureless opponent after you play it. It's still good in a deck that plays Day of Judgment, because now your opponent has to play two creatures post-Day as you already have a blocker for the first one. The fact that it taps for one mana is a handy thing as well, and it can do that on anyone's turn. Basically, it's a simple, defensive card that you add to your deck to give it a little more support. It helps you cast your big guns a little faster, and can block to ensure you live long enough to draw them. Warden of the Wall's abilities caught my interest the moment I read them. Not only are they partly something that's never been done before design-wise, it's a versatile card that provides two things a deck could want - a solid defender and extra mana - and does either when you want it. In a way, it reminds me of Guardian Idol from Fifth Dawn, but with less versatility and the inability to finish the game after everything else gets hit by Memoricide. There's a lot of early creatures (and accelerated late creatures) in Standard that aren't really slowed down by a 2/3 flying gargoyle, but if that ever changes, this card might well get a look in that setting. Otherwise, it's a reasonable if somewhat unspectacular performer, not to mention a flavorful addition to the Gargoyle tribal deck. 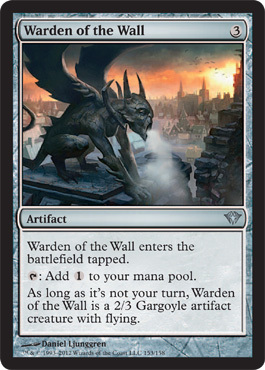 Today's card of the day is Warden of the Wall which is a three mana artifact that enters the battlefield tapped, can tap for one mana, and is a 2/3 with Flying when it isn't your turn. While this can't attack for you, the mana acceleration and blocking aspects are decent and can be an efficient addition for decks that are weak against Flying attacks. Other artifacts can tap for mana and this turning into a creature can be more of a drawback as it allows your opponent a wide variety of removal options if needed. Overall this is an interesting card that might see some play in specific decks, but isn't flexible enough for the more aggressive builds. For Limited just about any acceleration is good and having this work as a blocker later in the game makes it a better topdeck than many similar cards. As a artifact there is no reason not to include it in any Sealed build and it is a solid choice in Booster after the initial bomb and removal picks. Welcome to Pojo.com’s card of the day. Today we are looking at Warden of the Wall from Dark Ascension. Warden of the Wall is an uncommon artifact that costs three generic mana. Warden of the Wall enters the battlefield tapped, and taps to add one generic mana to your mana pool. While it is not your turn, Warden of the Wall becomes a 2/3 artifact creature gargoyle with flying. Warden of the Wall is one of the cooler uncommons I have seen in Dark Ascension. The fact you have a mana producer that becomes a defender is very nice indeed. Throw down a block and then use him to get some mana for a spell all at once. Very very effective.